I have blogged about the Genealogy Do-Over a number of times. It is a project started a couple of years ago by Thomas MacEntee. The concept was and IS a great one. For me, starting over, was not something I was willing to do. However, Going OVER what I already have made total sense to me. Think about it. I didn't know what I was doing when I started. My daughter gave me Family Tree Maker when I started, because she thought I needed something to do. Little did she know. Oh, and little did I know. In person classes, Genealogy in-person meetings, Hangouts On Air, Podcasts, Webinars are places to learn how to do this stuff. Its amazing how much "stuff" you can learn, listening and learning from and with others. Not to mention new features in Family Tree Maker. The three terms in the Subject are part of the Do-Over / Go-Over for me. With FTM2010, the Source Template feature was introduced to the program that was based on Elizabeth Shown Mill's book, Evidence Explained. It is our standard for how to craft citations. The other two items are also standards for our family research. When the Genealogy Do-Over concept was introduced, I jumped on the bandwagon, but in my own way. I have blogged about that before on this blog, under the Label of GenealogyDoOver. My goal has been to update my database to meet or attempt to meet the standards of these three items. Over the past couple of weeks, I have been, again, working on getting my 4,500 Citations into Source Templates. It's a slow process, time consuming, but worthwhile. Remembering that the Genealogy Do-Over / Go-Over was to look at what we have now, and apply what we / I have learned since I started. Focusing on the Citations, makes me do that. I need to re-look at the Information / Claims / Facts that are in the Source of information (like a book or Source) find, where in that book the information is (Citation), Select the appropriate Source Template that best describes What I am looking at, and Where did I get it from. Honestly answering those two questions will get me to the correct Source Template.It define the Container of Information. The Citation Detail (field in Family Tree Maker) helps complete the citation. I am mentioning all of this because I can across information in my database that I had entered a long time ago, but had forgotten about, because I wasn't using a Research Log or To Do List both of which I absolutely use in FTM2017. I found this problem while cleaning up my Citations and have created a way to track the clean up and have a plan to manage this clean up. The next one was even better. This "locate source" was linked to my maternal Grandmother. This time, I really didn't have a Source Title to Search, so I looked to see if Ancestry had a Hint for her, that I haven't looked at for a while. There is was, but it was even better then just giving me the ability to cite that source CORRECTLY but it was a page in a 1910 Yearbook, in the town in Pennsylvania where she lived. 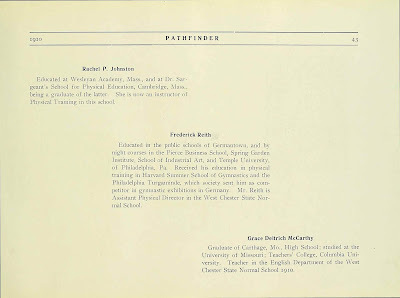 West Chester State Normal School, Pathfinder, (1910), Record for Rachel P Johnston, 1910 Staff; Online Image, Ancestry (https://www.ancestry.com : accessed 13 January 2019). 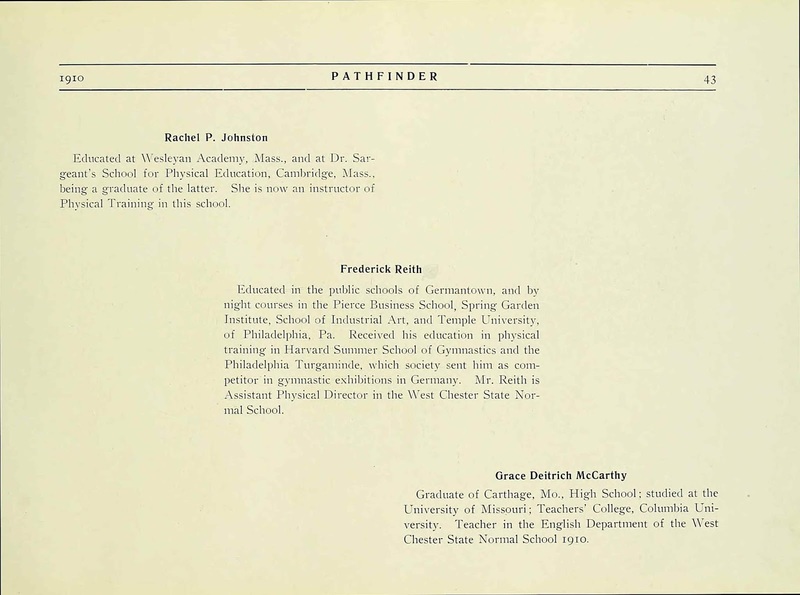 Yes, we know that Ancestry has a good Yearbook collection, but she had Graduated from High School in 1906, Her collage was in Massachusetts, where she graduated from, but this Yearbook was from 1910 and in Pennsylvania. Huh? It documented that she was on the Staff at West Chester Normal School, now West Chester University, in 1910. I knew that was the name of the school at the time, but her address was also at the Normal School in the 1910 Census. With this Source, with the information in this entry, I crafted my Citation and linked it to the Facts is that short paragraph. 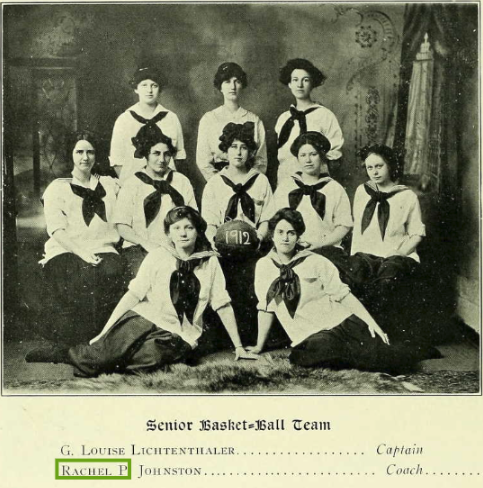 Which led me to the 1912 Yearbook, where she was a coach. I do not think she it in this picture, but she is listed as Coach. West Chester State Normal School, Pathfinder, (1912), Record for Rachel P Johnston, 1912 Basketball Coash; Online Image, Ancestry (https://www.ancestry.com : accessed 13 January 2019). Lesson Learned: Every once in a while, go back an look at what you have. In this case, I had a Citation that was not using the Template feature and I want my citations in that format, BUT it got me to relook at that record. Nothing new, but I was able to confirm small bits and pieces of data that i already had. Had I don't learned about EvidenceExplained, the Genealogical Proof Standard, and Mastering Genealogical Proof, AND the Features built into Family Tree Maker, I would not have found these two gems about my Grandmother. Great story. I appreciate the reminder to look back over my tree and source documents. My 1st cousin contacted me after Christmas and asked about our mutual grandparents. I had not updated that side in a long time. So am seeing lots of things that needed correcting. Which reminds me of a question. Much of my information for that side is hidden in emails sitting in my old Microsoft Outlook Express files that are no longer in an easy format to access. I have since moved on to using Gmail. How or where do you store emails for a source? Do you convert the message to a word document or PDF? You have probably covered this already, so apologies for a repeat question. I think of Google+ when I read your posts and must admit I have not read every post, especially over the holidays. Congratulations. Always a good idea to go back and look at what you already have. As to your Email Question. I try to locate a program what will open those old formatted emails. I have been successful back to the early 2000's. Still working on the late 1990 emails. Once I get those emails, where I can read them, I copy and paste the TEXT of those emails, into the NOTES tab on the Citation that I would create from that Email. I have email Citation from me to another person and a separate email Citation from that person to me. I don't convert them to another format, but I do get the Text into FTM2017. (I think I have blogged about that). The key to finding a program that will open the email, is the File Extension for the emails from that old program. So does FTM becomes your storage place for the old email? I assume you include the date of the conversation. I like your method of using a different citation for sent and received emails. Originally, I had been transferring (or converting?) the old emails into a Word.docx and then putting it in my general documents folder. Partly because not everything I was saving had genealogy connections and was more just for data preservation. Saving it as a FTM source will slow the process, because then I need to think how to encorporate it into my tree. Perhaps winter will be long and I can focus on one project to completion. I will end up with 2 copies of everything. What ever the original item is, email, document, photo, where I would NORMALLY file it, and the 2nd COPY in Family Tree Maker, properly Cited. If you look at the email Source Template, you will see that there are TWO Citations, or in my opinion, there should be and there ARE in my database. (to and from). I don't need to see the complete thread of emails, because that will be in my email program. Why: ? I may not Cite my Thank you email to the provider of the information that I saw and Linked to a Fact in FTM2017. The Citation to me, WILL have that citation. Yes, Citing your Source is slow. I have shared in the blog how I have learned to speed that process up. BUT, because I have cited stuff, all along, I have been able to go back to that Citation to find the information again. I think this blog post is an example of that. I had a Find A Grave contributor remove several hundred Memorials from the Find A Grave Website, gone, BUT I have them cited and over the past several months, many of them have been recovered, or re-created by the folks as Find A Grave or other contributors. (I have blogged about that) OR, what if a website goes away or moves to another website. I have blogged about that as well. Citing my sources is the FIRST THING I handle for ALL information in my database..
A Do-Over, just working on your Citations WILL pay off in the long run. I have been doing my Citation Do-Over for 3 years. So, don't be in a hurry. Work a couple at a time, do something else, and come back. I to a Record Group (Source Group) at a time. Repeating the process for the SAME Source will speed the process up. I use Evernote to record a lot of information about that Record Group / Collection, because I may not look at that source group of months, but when I come back, I know What I did an Why. All I need to do is to look into Evernote. Couple of thoughts to consider.